Physician; born Feb. 16, 1837, at Glasgow, Scotland; died Jan. 7, 1889, at London, England. He was educated at the high school and university of his native city, and was the first Jew in Scotland to enter the medical profession. In 1862 he went to London and became medical officer of the Jewish Board of Guardians, and in 1866 was appointed secretary of the Great Synagogue. About this time the idea of a union of the various London synagogues had been put forward, chiefly by Lionel L. Cohen; and Asher devoted himself to the project with intense energy. In March, 1871, he became first secretary of the United Synagogue, contributing largely to the success of that institution;he wrote the introduction to the by-laws of the constituent synagogues, and practically founded its visitation committee. This office he retained till his death. Owing to Asher's intimate relations with the Rothschilds, in his capacity of medical attendant, unofficial almoner, and personal friend, his advice was generally followed by them in communal matters. He was connected with a large number of institutions in the London community, and may be regarded as one of its organizers. In company with Samuel Montagu he undertook, in Jewish interests, journeys to Palesestine, America, and Russia. After the visit to Palestine he wrote a report on the condition of affairs in Jerusalem, which effected much good. His sympathetic nature attracted to him most of the young men of ability of the rising generation, and upon them he exerted great influence. 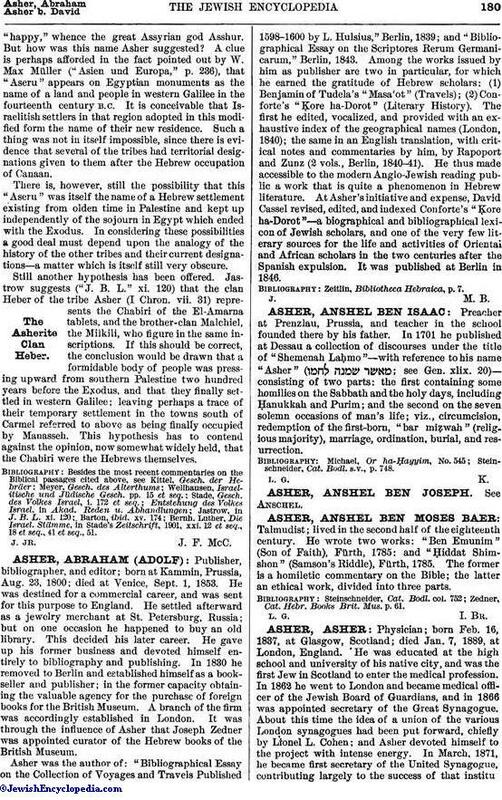 Asher wrote much for the Jewish press, chiefly under the pen-name "Aliquis." 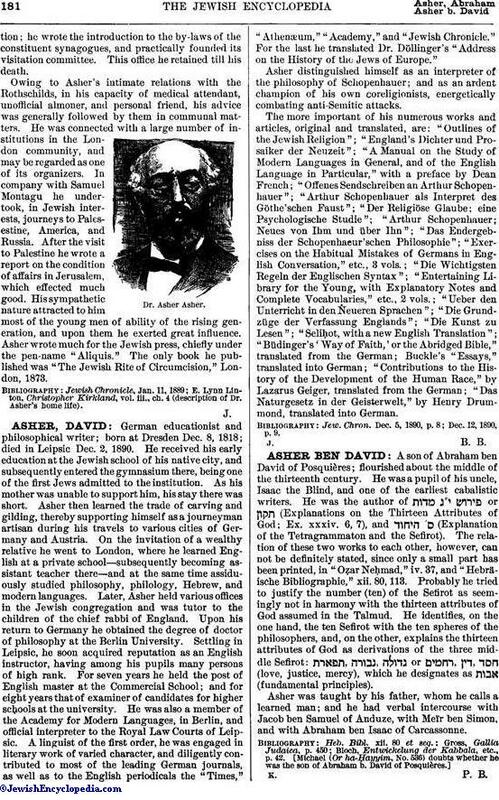 The only book he published was "The Jewish Rite of Circumcision," London, 1873. E. Lynn Linton, Christopher Kirkland, vol. iii., ch. 4 (description of Dr. Asher's home life).